There are a huge range of questions we need to ask when we're approaching a text for study. Most of these questions relate to one of four areas: Mode, Discourse, Lexis, and Grammar. The representative discussions of text extracts given below show how some of these questions can be answered. They don't attempt to deal with every possible noteworthy feature of the text, but simply to highlight some of the features worth mentioning. They also don't, on the whole, give much analysis or discussion of the significance of the highlighted features. They are intended to guide you through the initial stages of text analysis, and to show you how you can use sets of questions to extract information from texts. This category covers the physical appearance and presentation of a text as well as the way in which it is produced. • Is the text primarily in the written mode, or does it represent the spoken mode? Is it handwritten or typed? • Is the text spontaneous (a conversation, a scribbled note, an IM conversation) or planned (a lecture, an essay)? • Are written conventions used to represent spoken features? • Are there unconventional spellings or typographical errors in the text? This is a written text, which represents speech and separates it from the main narrative by the use of quotation marks and, on occasions, paragraph breaks. A bold, sans-serif font is used to represent text displayed on the screen of a BlackBerry. The use of all-capitals for these words conveys urgency and highlights the text on the page. Italicisation is used in the first line to indicate the sarcastic tone in which the word is spoken. In the penultimate line, Coupland uses quotation marks to show that the words "accessible" and "fun" are not those chosen by the narrator, but rather are buzzwords towards which he has a high level of contempt. The final line uses ASCII (a form of electronic text encoding) to represent the word "edgy", ostensibly because the word is so horrendous that the narrator cannot bear even to spell it out. Since only a very small minority of readers would understand this without consulting some kind of key, this has the effect of excluding the reader somewhat, whilst marking the narrator as a member of a particularly technology-based, geeky social group. The text is a loose written transcript of someone speaking. Punctuation, in the form of ellipsis (...) is used to indicate pauses or breaks; "ummm" is used for the same purpose, the spelling imitative of the sound commonly made when hesitating during speech. Words in brackets indicate some non-verbal constituents such as a sigh and a pause. These features strongly suggest that this is a spontaneous text, unplanned and unprepared. Another written representation of conversation. This time, the author uses non-standard spelling to indicate the speakers' pronunciations. In some cases, these pronunciations are themselves relatively standard, for example "gess", which represents /ges/, the most common pronunciation in British English of the word "guess". In contrast, the words "what I heard" are written "wor I urd", indicating the so-called "intrusive-r" between the first two words, "h-dropping" on the final word, and the usual South Welsh pronunciation of the vowel in "heard". The sounds represented are, approximately, , whereas an RP pronunciation would be more like . The elision of final [t] in the word "that" is indicated by an apostrophe, whereas in the word "what" it is represented by a change in spelling - "wo". The author also uses the repeated letter "e" in the first sentence to indicate that the speaker emphasises the first syllable of the name "Leanne". The excessive number of "e"s suggests that the narrator finds this irritating. This category covers the sense-structure of a text, and its context. • Is there an implied audience for the text? Is the audience immediate or remote? Is it large or small? Which features of the text construct that sense of audience? • Who is the narrator/author/speaker of the text? What are his/her attitudes and how are they expressed? • What is the context of the text? Is it public/private, official/informal, factual/fictional, literary/non-literary, prose/poetry? • Does it have an obvious function - to instruct, to persuade, to supplicate, to thank? • What is the genre of the text? Is it a newspaper article, a letter, a gothic novel, a romance, a legal report, an instruction manual? • Does it draw on linguistic features from different genres? Does it subvert generic expectations? • How does the text relate to other texts or cultural artefacts? Is it a parody or an imitation? How does this relationship reveal itself? • What linguistic register does the text use? Is it archaic, formal, technical, casual, colloquial? Does it draw on particular social, regional, occupational dialects? • Does the text use figurative language such as metaphor, symbolism, imagery, or rhetorical structuring? Are there examples of lexical or syntactical patterning? Text 4: Hansard Reports, House of Lords, Monday, 1 March 2010. Lord McKenzie of Luton: My Lords, I am not sure that we have much evidence for that particular assertion. As the noble Countess will recognise, because I think she was involved in our debates on the Welfare Reform Bill, there has been a lot of focus on helping people back into and closer to the labour market-particularly helping lone parents, most of whom are women-and on supporting them so that they can actually move into employment. If one looks at all the issues around poverty, one sees that the thing that makes the difference is people's employment opportunities. Lord Davies of Oldham: I am sorry, my Lords, we must move on. This is an public text, taken from a transcript of proceedings in the British House of Lords. Its function is to be an official record, consultable by any interested party. There are, therefore, two implied audiences. The first is the immediate audience: the members of the House of Lords present at the time. The second is indirect: any member of the public who is interested in checking the record. The first audience is addressed by Lord McKenzie with his opening "My Lords", and this form is echoed by each of the two subsequent speakers. This suggests that we are dealing with a formal register, at least as regards the introduction of each new speaker. The text indicates that turn-taking in this formalised environment is controlled by a particular speaker, here Lord Davies, and that the opening "My Lords" is part of a new speaker's signal of his or her intention to take a turn. The manner in which people are addressed here is formalised, as we see from Lord McKenzie's reference to "the noble Countess". People are not addressed or referred to using second- or third-person pronouns, but indirectly, using their title. The function of Lord McKenzie's speech is to persuade and instruct, as can be seen from the structure of what he says. He begins by challenging the statement that preceded his own, and uses clauses which assume agreement with his own position: "As the noble Countess will recognise", "If one looks... one sees". There is no use of colloquialism here, and the use of the pronoun "one", if not archaic, is considered particular formal in contemporary usage. The language is largely non-figurative. The only metaphors used are familiar, or "dead" metaphors: "move into employment", "issues around poverty", "one sees". America when I was seven momma took me to Communist Cell meetings they sold us garbanzos a handful per ticket a ticket costs a nickel and the speeches were free everybody was angelic and sentimental about the workers it was all so sincere you have no idea what a good thing the party was in 1935 Scott Nearing was a grand old man a real mensch Mother Bloor made me cry I once saw Israel Amter plain. Everybody must have been a spy. The text is addressed to America. We can interpret this as an address to the country as a personified entity, or we can see "America" as metonymic, using the name of the country as a way to refer to its inhabitants. The narrative in the first section or paragraph is rambling, akin to the stream-of-consciousness style. This tone is achieved by the lack of punctuation or capitalisation. What would, in standard writing, be separated off as clauses or sentences with commas, full stops, and other punctuation marks are here allowed to run into each other. Apparently parenthetical remarks, such as "a ticket costs a nickel", are also incorporated into the narrative stream without separation. The sentence-units within this stream of consciousness are themselves generally syntactically simple, with no grammatical subordination, which adds a tone of almost childlike simplicity. Through these techniques, the speaker is made to seem unsophisticated, and perhaps even deranged. The text demands a certain level of familiarity with the history of mid-century America in order to be interpreted. The activists Scott Nearing, Mother Bloor, and Israel Amter are mentioned as though the reader should be familiar with the names. The tone of the piece is informal and colloquial, as indicated by the use of the dialect word "mensch", the conversational "you have no idea" and non-standard grammatical constructions such as the adverbial use of "plain". This is not a traditional piece of poetry. It seems to be structured like prose, with no significant use of line breaks or any of the more traditional features such as rhythm and rhyme. Nonetheless, there are features that we might identify as poetic. The word "angelic", for example, is clearly figurative and is placed next to "sentimental" to create an auditory assonance. Attention to aural features is again seen in "a handful per a ticket a ticket costs a nickel", with the repeated /?k/ sound. • Is the lexis formal or informal? Are there technical or subject-specific lexical sets? • Are nouns concrete or abstract? Are verbs stative or dynamic? • To what extent is modification used? Are adverbs and adjectives used prominently or not? • What lexical fields are evident? Are they ones you would expect to be applied to the subject-matter? • Does the text draw on the ambiguity of word-meanings? Does it include puns or other ludic uses of language? • Are any words repeated in the text? • Are there any swear words or other words usually considered taboo? Does the text use euphemisms? The lexis of this text is relatively colloquial, though not markedly so. Clichés and colloquialisms like "cautionary tale" and "the pursuit of speed" create a sense of casual conversation, as do the lack of specificity in noun phrases such as "a few weeks", "a growing pile", "anything to do with computers". Subject-specific language is very evident: "computers", "personal micro", "Apricot pc", "two-disk drive", Wordstar, "word processing", "back-up disks" all relate to the field of personal computing. These words make up a large proportion of this extract, effectively dominating the lexis. There is no use of ambiguity or word play, although the non-standard placement of "But" is an informal and relatively playful indicator that some kind of refutation of the preceding text will now occur. The balance of factual information with emotional interest is indicated by the range of modification used. 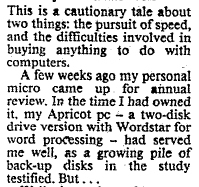 Nouns are modified using technical terms ("two-disk drive version", "back-up disks"), and descriptive adjectives ("growing pile", "cautionary tale".) The former examples add to the sense of dense technical language by using compounds as modifiers, packing a number of concepts into a single noun phrase. There is some use of figuration, though it is relatively conventional: the author personifies his computer, saying that it "had served me well", and goes on to personify the back-up disks, which "testified" to his computer's performance. The fully printed lips of a woman. There is a jarring disjunction in the lexis of this stanza. "Afloat" and "fully printed" are rather formal, while "fully printed lips of a woman" suggest a romantic lexical field. In contrast "toilet paper" is mundane, and coupled with "unflushed piss" it creates a field related to bodily functions and a colloquial, somewhat crude, tone. fact that the noun phrase "a piece of toilet paper" is a common collocation removes any sense that the post-modification is at all ornamental, unlike the final line, a noun phrase with "lips" as its headword, pre-modified by "fully printed" and post-modified by "of a woman". The grotesquerie of "Afloat in unflushed piss" as modifier of "a piece of toilet paper" is more ornamental, but in a very unconventional manner, with the prominence of the taboo word contrasting with the "lips", a word with which it resonates aurally. The whole stanza can be interpreted as a single noun phrase, with "lips" as its headword, and a number of prepositional phrases post-modifying it: "On..", "Afloat...", "of...". This reading encourages us to see the lips as directly related to their unpleasant context. Despite being a concrete noun, "lips" here refers to something ephemeral, presumably a lipstick mark. The preposition "of" takes on an extra meaning, seeming to represent the removal of the lips from the woman who originated them as well as the possessive relationship between woman and lips. There are no verbs in the passage. Two past participles are used adjectivally, "unflushed" and "printed", suggesting that we are witnessing a past state, something that has happened before we arrived and is now suspended in time. • Is the mood declarative, interrogative or imperative? • Verbs - is the tense past, present, or a compound tense? Are modal verbs used? • What use is made of co-ordination or subordination? What kinds of subordinate clauses are used, and what role do they play in the sentence? • Are marked themes or end-focusing used to draw attention to elements of the clause? • Is the grammar standard or non-standard? • How do grammatical structures help to organise the text? Are sentence adverbials (However, Nevertheless) used to express relationships between different parts of the text? One of the most notable features of this extract is its lack of tensed, finite verbs. There is no sense of time because the author chooses to write in minor sentences. The first sentence, "Fog everywhere", is deliberately simple, the structure suggesting that no more needs to be done than name the subject, "fog", and give it an adverbial attribute, "everywhere". This word lexically and grammatically encompasses everything that can be said about fog, and the following sentences merely elaborate on it. The subsequent sentences also tend to consist of the noun, "fog", and a series of adverbials, mostly constructed as prepositional phrases or non-finite clauses. The author creates parallel structures with his sentences, as though to provide pairs of categories which encompass the same range as the initial "everywhere": "on the Essex marshes" / "on the Kentish heights"; "creeping into the cabooses" / "lying out on the yards". The pairs tend to complement each other - in and out, up and down. There are nested phrases and clauses used adverbially, which build up complex structures that add to the sense of ubiquity and claustrophobia. So we see "Fog in the eyes and throats of ancient Greenwich pensioners, wheezing by the firesides of their wards", where the adverbial element consists of a compound prepositional phrase whose nouns are complemented by a second prepositional phrase, whose noun is in turn complemented by a non-finite clause which is, finally, itself post-modified by a prepositional phrase. Text 9: an extract from a CIA memo of Sep 14, 1993. The text represents two different times in the past: the simple past, "met with a relative", and a past time relative to that simple past, "had died". We have a contrast therefore between the use of the simple past tense and a past perfect construction. The first sentence uses a non-finite clause ("to inform...") acting adverbially, describing the purpose of the KGB meeting, as well as a number of other adverbial elements. The first, "several years ago", expresses time, the second, the prepositional phrase "with a relative...", describes the circumstance of the meeting. There is a second subordinate clause embedded in the first: "that the diplomat had died...", which itself contains two prepositional phrases expressing time. This structure indicates the relative complexity of the information to be put across by this text, as well as the importance of precise contextual information. The second sentence is equally densely structured. The subordinate clause "where he might have been..." is post-modifying a prepositional phrase which is part of another prepositional phrase which post-modifies a noun: "too famous a [figure [to put [in a prison camp [where he might have been recognized]]]]". The complex structure of these sentences contrasts with the final sentence of this extract, which has a relatively simple Subject-Verb-Complement structure, although the subject itself ("the rumor...1960s") does contain a subordinate clause. The sentence adverbials, "However" and "Therefore" reflect the logical structure of the text and make its argument plain. The first sentence sets up the details of the initial situation, the second gives information to contradict these details, and the third concludes that the initial statement must be false.